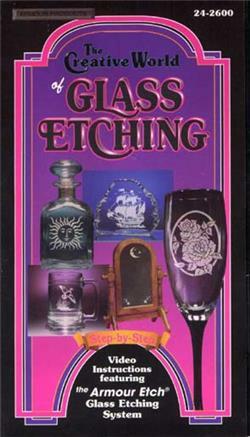 Whether you are a beginner or an experienced crafter, Syd and Terry Picone will teach you step by step just how easy it is to etch glass and use their creative mirror stripping process. You'll quickly learn how to transform ordinary stemware and mirrors into elegant designer accents. Included are tips and helpful hints on the proper use of glass etching cream, how to apply pre-cut stencils, and how to cut stencils of you favorite patterns and turn them into finished, etched designs. All of the material used on this tape are listed in our section entitled "Etching and Engraving Stuff".